Peter Everett, 48, is far more than the soft-spoken professor of first impression. His paintings speak to a remarkably powerful inner core of human spirituality that most people are either unaware of or choose to ignore. 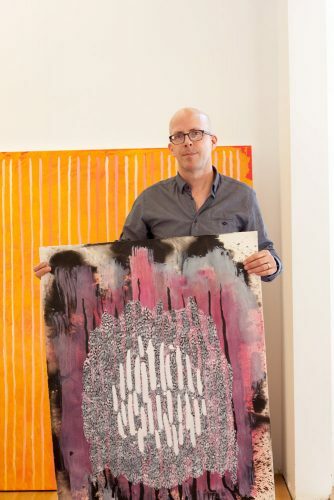 His current show at Ephraim’s Granary Art Center demonstrates this through powerful, center-focused, nearly symmetrical compositions that channel energy through vibrant colors and fluid mark-making. 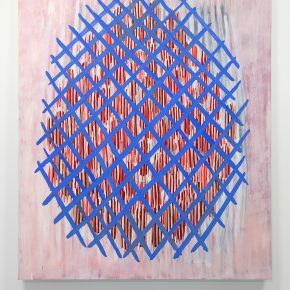 In his statement, Everett describes his show as “forms that have an immediate visual power, a physicality and sense of urgency emerging from a place just beyond sight.” His interest lies in liminal spaces, the area between sleep and wakefulness, the slippage between a painting’s subject matter and content, the difference between what an image shows and what it embodies. Though the idea of liminal spaces in between ritualistic action aligns well with Eastern philosophy, one of Everett’s strongest influences is something much more mundane – Donkey Kong. “I was in my formative years during the golden age of video games in the early 1980s. I would play Donkey Kong in arcades, trying to rescue the princess, but because of a glitch in the game, the cycling levels break down at a certain point and you just die,” he laughs. He describes Donkey Kong as a sort of “low-culture Western back door into Eastern philosophy”; a repeating cycle with no destination other than the erosion of self and the death of the hero. It was, he says, his first experience with a sort of meditative space. “If you play it enough, Donkey Kong is repetitive, reflex-based and very physical leading to a trance-like state of play. After high school, Everett attended Brigham Young University, where he completed his BFA and met his wife, Leah. They then moved to New York, where Everett attended the Pratt Institute in Brooklyn, completing an MFA in 2000. 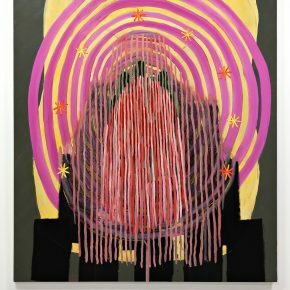 Though Everett has completed some sculptural and new media pieces, he approaches these challenges from the standpoint of a painter. “I did my MFA in painting at Pratt. I also was involved in printmaking, but in a very painterly way. My training has definitely influenced my work in other media,” he says. In Germany, Everett worked on a series of ink drawings but was again drawn to painting because of its physicality and color. 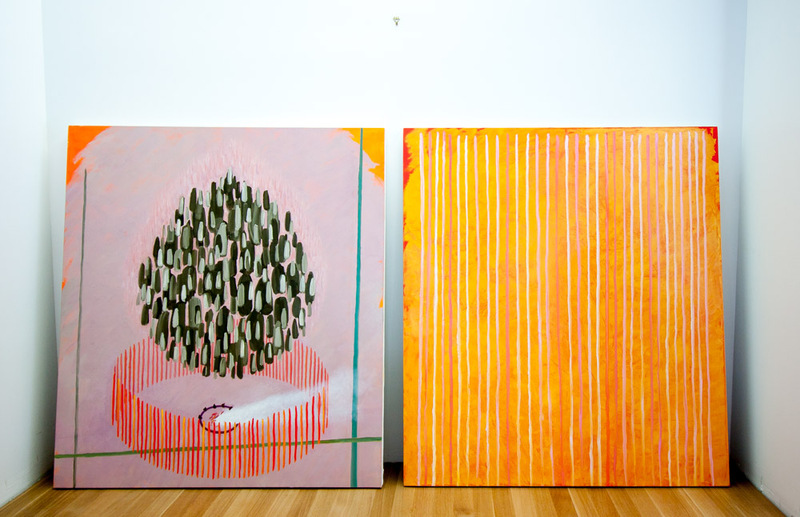 “I like paintings that have a generosity to their aesthetic and colors,” he says. His color palette tends to be warm, dynamic colors with neutral tones on top, acting as screens or occlusions. “I like to have layers in my painting. I like some information to be redacted,” he says. “I’ve always really liked the choir screen of Catholic churches, how they block the view and objects and forms are seen through them.” His works tend to be centered, like an icon or talisman. Pulling from a rich history of centered compositions, this focus gives his work a spiritual credibility, a familiarity, and urgency. Everett likes to work large, commenting that the larger scale allows for more freedom and rhythm in his movements. 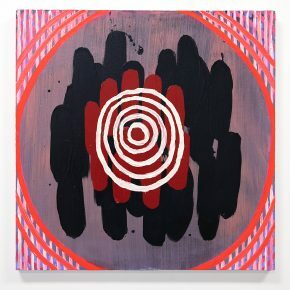 “When I make work, it’s important for my brushstrokes to be synced with my movements, connected to my body,” he says. 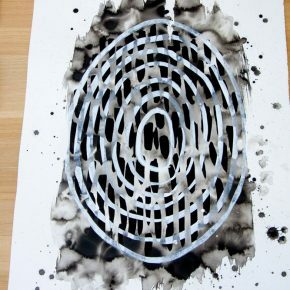 To achieve this, Everett usually paints when he exhales and uses his shoulder rather than his wrist to make marks. 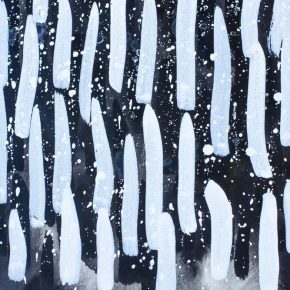 A few of his works include a particular mark: short, straight lines, grouped together in teardrop patterns. He calls this particular mark an exhale tally, each line marking one breath. “I once heard a poet talk about how every word spoken is an exhalation and a step toward death, so in a way, when you are speaking poetry, you are giving up some of your life,” he says. “I found that an interesting thought…I also have a lot more control when I exhale than when I inhale. More energy goes into the painting when I breathe out.” Each line is either one, short, outward breath, or a long line for one long exhalation. 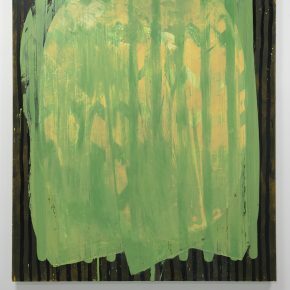 Similar to his childhood experiences with Donkey Kong, Everett’s painting state is a meditative one, focused on the loss of individuality in favor of extending his energy into his work. The centered compositions offer a feeling of suspension to the work, the main patterns rarely engaging the edges. This suspended feeling plays into the idea of liminal spaces, unused power transferring from one object to another, from artist to canvas, from canvas to viewer. 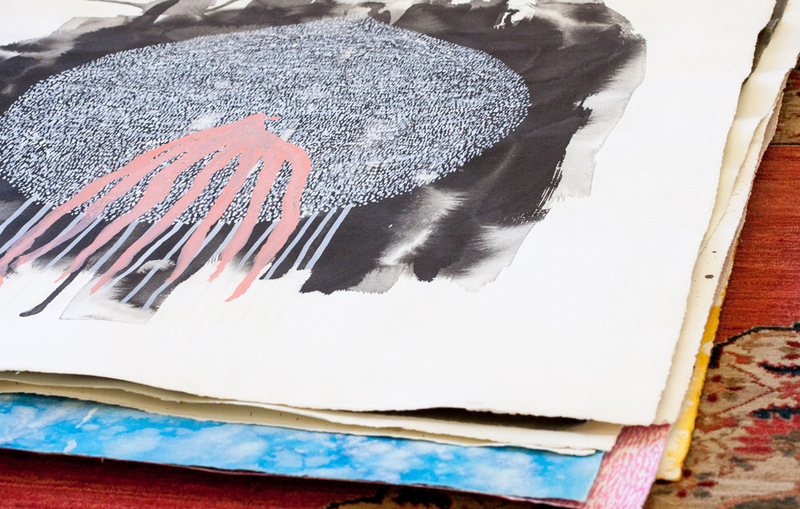 Everett’s process is a complete focus on materiality, a freeform series of physical events. 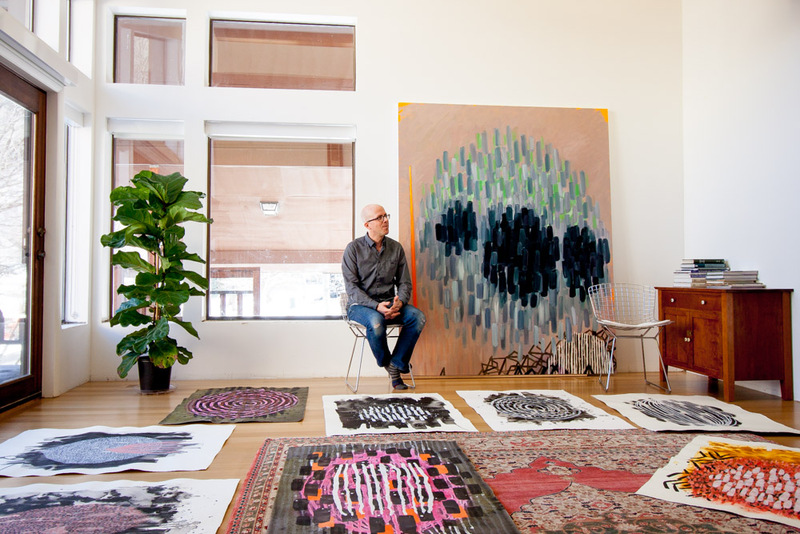 “I like that painting is a slow way to make an image,” he says. “Now it is so easy to make images quickly. We snap pictures on our phones, we use Photoshop, there is an immediacy and an ease with technology.” He continues, “Painting is a very primitive and inefficient way to create an image and that’s something I really like.” Though he plans parts of his paintings beforehand, he considers them “meditative diagrams,” a record of bodily movement instead of a conceptual map. For Everett, the very concrete nature of the painting preparation process is also important to his work. 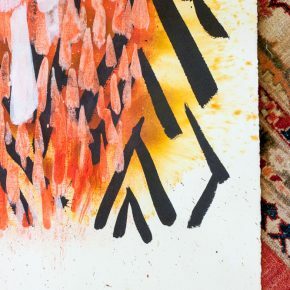 He likes to slow down the process even more by grinding his own paint with historic or found pigments, stretching his own canvas, and, more recently, designing his own workspace. 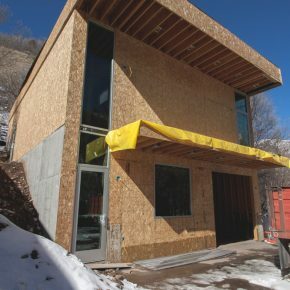 Next to his house in Spanish Fork Canyon, Everett has been working with an architect in Salt Lake City building a two-story studio. 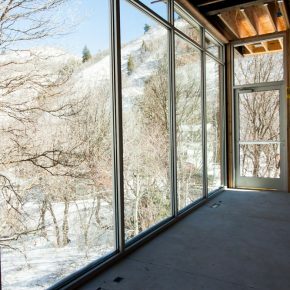 Large and open, the space features a multitude of large windows looking directly out at a sea of photogenic scrubby maple and oak trees. He jokingly refers to his neighborhood as the “poor man’s Sundance” absorbed by nature without some of the nicer trappings of a resort town. 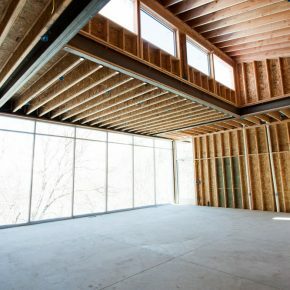 Commenting on the size of the structure, he says, “I wanted enough wall space to accommodate large canvases and paper.” The airiness of his new studio, combined with the abundance of soft sunlight pouring through the windows is a dream, Everett’s dream, which he hopes will be the location of years of future work. Everett’s work touches on a powerful in-between space, a Neverland space, which speaks to a very central earthly experience. His painting reflects the feelings of questioning spiritual power and divine elements in a physical space. 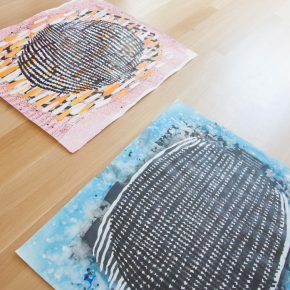 The large size of his canvases creates an all-encompassing, visually magnetic experience, exploring the deep connection that we have with visual objects and the processes of making.